Home › green streets › Beijing tackles air pollution by shifting the muck around. Beijing tackles air pollution by shifting the muck around. 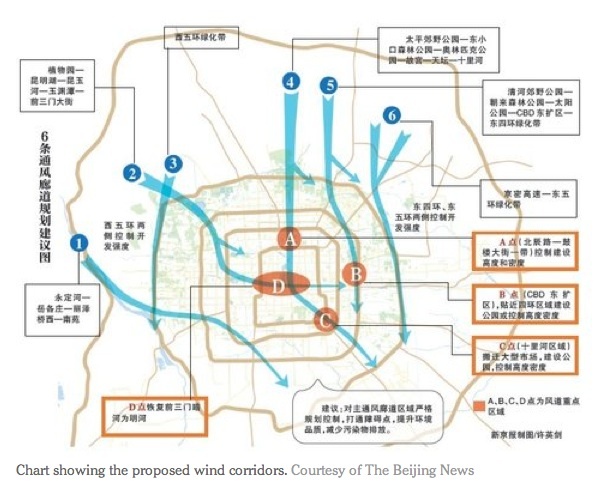 Beijing is planning a network of “ventilation corridors” to promote air flow and blow smpg away. Five main corridors will be 800 m wide and minor ones will be 80 m wide according to Wang Fei, deputy head of Beijing’s urban planning committee. Five main corridors are proposed. Peng Yingdeng, air pollution expert at Beijing Municipal Research Institute of Environmental Protection, advised the Beijing News that the plan was not for large-scale demolition or construction, but it was more an adjustment of current regulations to limit building heights and densities in specified areas. Beijing’s plan is to reduce air pollution levels by 40% by 2020.